Three weeks ago, we reported that Asus was launching the first two FM2+ motherboards for upcoming AMD APUs. Today, it is Gigabyte’s turn to introduce its lineup of FM2+ motherboards for upcoming Kaveri chips. The Taiwanese manufacturer announces not a mere two boards though, but a full range of 7 products. The new offerings from Gigabyte include a total of 7 new motherboards; 4 ATX size and 3 micro ATX boards. All but one are based on the new A88X chipset, which is likely to be seen on FM2+ motherboards only. The previous top dog chipset for AMD APUs, the A85X, now seems to aim at more affordable offerings. 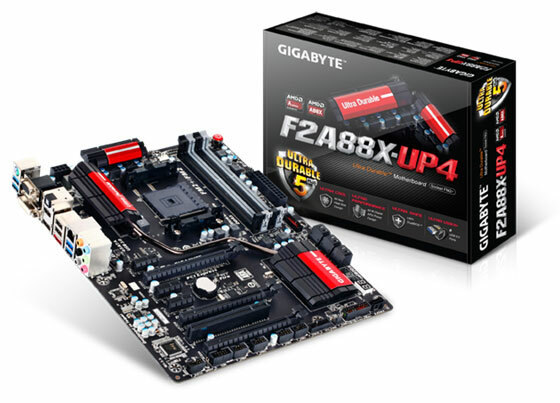 GIGABYTE A88X series motherboards feature the new FM2+ APU socket, and are designed to get the most from forthcoming Kaveri AMD APUs, while preserving compatibility for current AMD FM2 APUs. FM2+ AMD APUs offer native support for 8 GT/s PCI Express gen 3.0 as well as DX11.1 support integrating the high performance ‘Steamroller’ core. AMD socket FM2+ APUs also offer native support for 4K resolution displays on HDMI and DisplayPort. As we reported earlier, the Kaveri family of APUs will be available for purchase in the retail market only in early 2014. We believe that won’t stop the new FM2+ motherboards to show up in stores this fall though, as they are fully compatible with current Trinity and Richland APUs.